Today Bannack stands as a total ghost town, with not a single person living there, though at one time was known as the capital of Montana territory during 1864. After a huge amount of gold was found in the area in 1862, it took only a matter of weeks before people started to call this place home, and the town quickly grew to include three hotels, three bakeries, three blacksmith shops, two stables, two meat markets, a grocery store, a restaurant, a brewery, a billiard hall, and four saloons, not to mention several hundred houses. The town grew constantly until the end of the gold supply was in sight, and the population started to dwindle until the mines closed down, when only a handful of residents stayed, with the last of them leaving during the 1970's. The town is very remote and hard to get to, connected to the outside world only by a single track railway, making it much more trouble than its worth to stay here for any other reason than to mine gold. 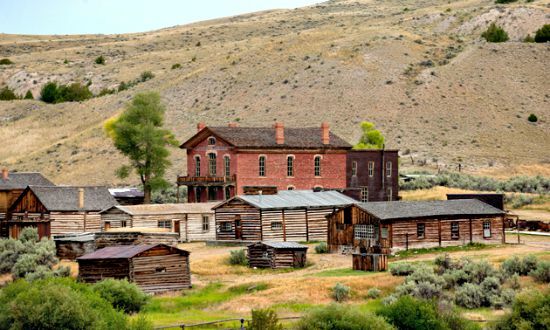 However the town comes to life for 2 days a year in an event known as "Bannack days" when people dress up and re-enact life in a boom town, which has become quite a popular tourist attraction. The town is maintained as part of Bannack state park and has been listed as a national landmark, and since its out in the open it seems to be accessible to the public all year round. Is Bannack Ghost Town Haunted? There isn't an abandoned boom town in America that doesn't have a few ghost stories, but the reason for the ghosts at Bannack are a bit more unusual. Normally you can expect the spirits of miners who died in accidents or people who were shot in the street to be the main spirits at a place like this, and even though there are quite a few accounts of people witnessing such spirits, the main culprits are that of a gang led by a sheriff. The story goes that the Sheriff of Bannack, Henry Plummer, had his own gang who by some accounts were responsible for over 100 murders. The murders took place within the towns gold fields and also Virginia city, where they robbed and killed anyone they felt like, and since the gangs leaders were made up of the towns lawmen, it was extremely difficult to stop them. There were only 8 documented murders that the gang were believed to be responsible for, leading many to question if they killed anyone else or if the gang even existed in the first place. Whatever crimes the gang could be proved to be guilty of didn't make any difference on January 10th, 1864, when Plummer and 2 of his deputies were hanged without trial in the town. After this a number of his known associates were rounded up and also hung, and the rest were banished and threatened with death should they return. It is the gang members who are believed to be responsible for the majority of ghostly activity that goes on in the town today, with some people even claiming to have seen apparitions of the whole gang together. The stories of paranormal activity here are endless, everything from the usual orbs and strange mists, to sounds of gunfire in the distance coming from empty areas and people being touched by the spirits.